Stored food and water should be rotated out every 6 months so it stays fresh, and you may need to reassess your kit every year or so as your family needs change (i.e. no longer needing diapers as your child ages). If possible, items should be kept in air-tight plastic bags. Keep the items you would most likely need in the event of an evacuation in a portable container such as a backpack, duffle bag or plastic bin. It is also a good idea to create a kit for your car, especially if you have a long daily commute. In the Winter Storm of 2006, motorists were stranded all over the Adams County area simply trying to complete their commute home. A car kit can be a life-saver. 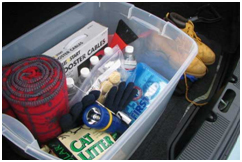 Also if you are traveling or vacationing in another area with hazards and changing conditions, such as in climate weather it is even more important to have weather specific items in your car kit. Emergency Supply Kits can be pieced together from items you can find at your local grocery and home improvement stores. Yet all of these items will take time and money to acquire. We recommend that larger families and those with tight budgets buy one or two items at a time and slowly piecing your kit together. At a minimum, focus collecting non-perishable foods, water, first aid supplies, and blankets. Water should be stored in plastic containers such as soft drink bottles. Avoid using containers that will break or decompose, such as milk cartons or glass bottles. A normally active person needs to drink at least two quarts of water each day. Hot environments and intense physical activity can double that amount. Children, nursing mothers, and people suffering with an illness will need more. Store one gallon of water per person per day. Keep at least a three-day supply of water per person (two quarts for drinking, two quarts for each person in your household for food preparation/sanitation). It is ideal to store at least a three-day supply of non-perishable food for you and your family. Select foods that require no refrigeration, preparation or cooking, and little to no water. Select food items that are compact and lightweight. If you have family members with special requirements, such as infants, elderly or disabled persons, you may need to consider adding some or all of the following items to your kit.